A lone Federation station, in orbit of a nearby loyalist planet, slowly drifts through space. It has been exactly 3 years, 4 months, 2 weeks and 5 days since you last saw a Rebel ship. Sometimes you wonder why the Federation still has you and your crew stationed here, in an abandoned sector, nine sectors away from the last Federation base. Every once in a while a Federation cargo ship passes through, for you, a good opportunity to have a debrief about any news from the war. Most of the reports are the same, the Federation is losing, the Rebels are winning, nothing new. Rumors say that the Rebellion will attack the Federation base soon. This day starts the same all the others, every day the Rebels get closer to the Federation base, and you (along with most of the station's crew) seriously consider if the Federation is still worth fighting for. You and your crew know that if the Federation surrenders after the base has been taken over, that the Rebels will not be taking prisoners. Suddenly, a mercenary ship jumps nearby, scanners show that it is a Federation Bomber class ship. Heavily damaged, the ship poses no almost threat to the station. You hail the ship several times, but the hails go unanswered. A second scan shows that there are only faint life signatures on board. You and a two others go to the teleporter, your teleporter locks on to the enemy ship, and suddenly, you're standing in the engine room of the enemy ship. Corpses are everywhere, it doesn't look like anyone is alive on the ship. "This one... This one's alive! Guys, come quick!" That was one of your crew, it looked like the voice came from the helm. You quickly run to the front of the ship, only to find your two crew members standing near an injured mercenary, who is sitting in the seat near the helm. "S- Sir?" Your crew member sounds nervous, and you decide that it should be you that should be doing the talking. You step forward and see that the mercenary noticed you. Sir, who are you, and what are you doing here? You ask. "I was the captain of a small mercenary fleet, scanners on our base had shown that a Rebel station was recently deployed near a lone planet in this abandoned sector, the Rebels probably thought that nobody was even in this sector. Shortly after, we captured the Rebel station, on board, we found some data that could be really important to the Federation. Taking a closer look, we found out that this data might change the outcome of the war." Your crew is both curious and excited, one of them asks: "Well then, what and where is this data?" The mercenary captain grabs a hard drive that was laying on the floor, he hands it over to you. "I was going to sell it to the Federation, me and my crew would've been rich. But just when- "
He coughs up some blood. "But just when we were going to jump away, seven Rebel ships jumped nearby. We don't know how they knew we were there, I guess we triggered some kind of alarm mechanism when we extracted the data. They immediately opened fire on us. We noticed that our FTL was disabled by a hacking unit on a Rebel Rigger. We were no match for the firepower of the Rebels, most of my fleet got destroyed. I gave the order to fire a big salvo on the Rebel Rigger, it was enough to disable it's hacking system for a few seconds, which was just enough time for us to jump away." He pauses for a moment, probably due to his injuries. "I don't think anyone else got out alive... Please, I don't want any reward, just make sure you get the data to the Federation base, I just want revenge on those Rebel bastards." You send copy the data and send it to the station, you hear enthusiastic crew talking through the intercom. The station's captain speaks: "This data can turn the war around, get this to the Federation base." You notice jump signatures... Rebel ships have jumped nearby, they must be after the data! The mercenary ship was in a hurry, and probably forgot to mask it's jump signatures. You hail the station: "Captain, do we have permission to leave our posts and go to the base?" "Affirmative. Get that data to the the base." Is the response. You start to charge your FTL, Rebel cruisers jump nearby, followed by more Fighters and Riggers. They start to bombard the planet. The Anti-Ship Batteries and a few Federation ships that are near the planet fight valiantly, but they are no match for the Rebels. "Wait! Wait! We have to inform the people on the planet! My family is still there!" Says one of your crew. "Yeah, my friends are probably at a bar, waiting for me to return! We have to warn them" Says the other. You are tempted to save your family and friends, but you decide that the Federation has to be saved. "Negative. Our mission is to get this to the base, that is our goal, and we don't have time to save them!" Your crew realizes that there is no other option, while the FTL charges, the station sends Hull Repair drones, to fix up the damage on the ship. Meanwhile, you and the crew stare out of a window. You see that the planet gets absolutely ravaged by the fleet, but there is nothing you can do. Your friends, your family, your people, they are all dead. The Rebels now start to engage the station, which doesn't stand a chance. You jump away, to a nearby Long Range Beacon. It can get you to a civillian sector. After the jump, you realize that there is no way back, everyone you have ever known is dead, and you have to complete a very dangerous mission, who knows what dangers are in the next eight sectors? And if you do complete the mission, will it be worth it? Was sacrificing everything just to give the Federation a chance of surviving the right thing to do? You and your crew aren't sure. You will have get to the base to save the Federation, or die trying. This is the ship image, it is a retextured Federation Bomber. 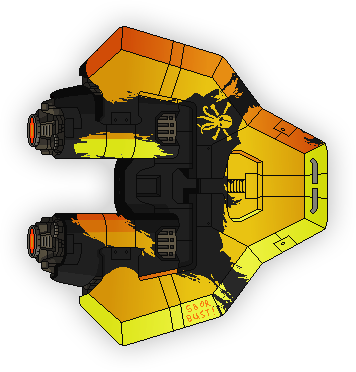 Replaces the Kestrel Cruiser Type C.
- Changed ship image to have 'functional' engines. - Improved Doors to level 2, because fires are really dangerous on small ships. - Changed the default ship name to 'Pyrrhus'. - Fixed some minor positioning issues. 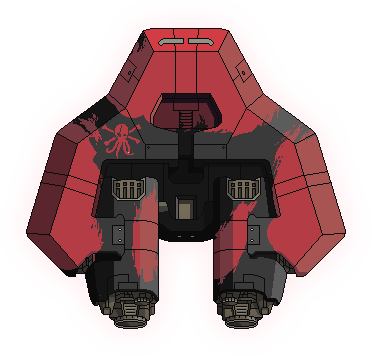 I am very active on the FTL modding forums and I will update the mod whenever I can. Gibs: Superluminal 2 doesn't have a working gib tool yet, so there are no gibs for the ship as of now. Bugs: If you find ANY bugs, post them here, preferably with a screenshot. I will fix them as soon as I can! Last edited by sovietbear on Tue May 27, 2014 6:06 pm, edited 13 times in total. Custom hull is about 50% done. what is the hull to be exact? R4V3-0N wrote: what is the hull to be exact? This is the hull as of now, still working on it. Probably finished within an hour. You should add some traces from your story onto the ship, for example you could add a defunct or broken hacking drone on the side of the hull near the shields, or some wear and tear on the side fin. Did you use my purple+ black pirate hull? Update 1.10 is nearly finished! Voltion99 wrote: You should add some traces from your story onto the ship, for example you could add a defunct or broken hacking drone on the side of the hull near the shields, or some wear and tear on the side fin. Great ideas, I'll look into implementing them. Thanks for the feedback. FtDLulz wrote: Looking nice so far! Thanks! Spent a lot of time on the ship image. 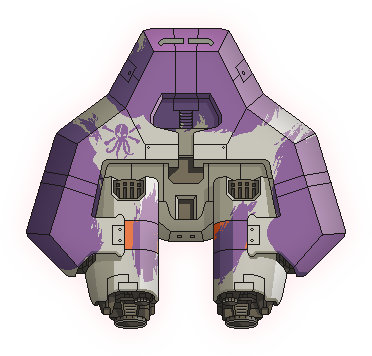 R4V3-0N wrote: Did you use my purple+ black pirate hull? but there is 1 small problem with what you said. 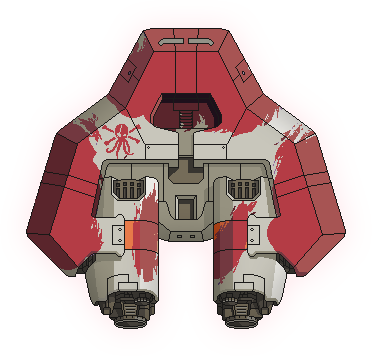 But thinking more into it, you recoloured the pirate federation bomber first didn't you, because I already made various pirate bomber fed hulls. 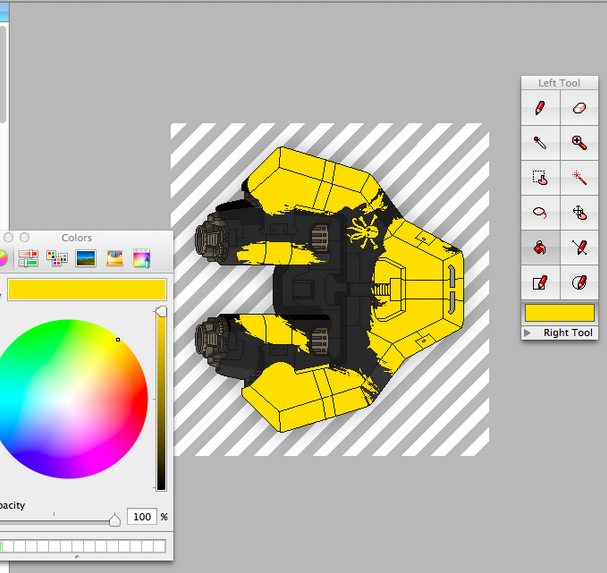 So it looked like at first you were using the black + purple with some designing in yellow into it. Did a bunch of small updates. Details are in the thread above.